There are lots of different ways that you can support us,from monthly and one-off donations, fundraising activties, to simple actions that won’t cost you a thing. 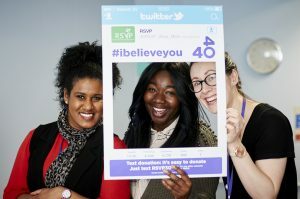 However you support us, don’t forget to share it online using hashtag #ibelieveyou and spread the word that you believe survivors. Donations are processed via PayPal: for one-off donations you can pay with a debit/credit card if you don’t have a PayPal account; monthly donations require you to have a PayPal account. Localgiving.com: You can make monthly or single donations online. Don’t forget to add Gift Aid, meaning your donation increases at no extra cost. eBay: When selling your items on eBay you can donate a percentage of the sale price to RSVP. Payroll Giving: Sign up to give straight from your payroll, before tax, through Charities Aid Foundation. Give a gift.We have a wishlist of items we need to deliver our services, from children’s counselling resources to instant coffee and printer paper. Shop online. Books, cards and crafts are all available on our very own shop. Give as you live: A shopping app that directs a percentage of every purchase you make to us, at no extra cost to you! Simply visit www.giveasyoulive.com or www.easyfundraising.org.uk to learn more and download the apps. Everyclick: Make Everyclick your internet search engine and nominate RSVP as your charity. Every time you click on the internet we get a small sum of money at no cost to you. If you would like to fundraise for us, we would be hugely grateful! Bake sales, dress down days and fun runs are all great ways of raising much needed funds. Our Fundraising Pack will get you started.